For years, the energy industry has been looking to seaweed to become the next big source of biofuel. But the algae plant has its drawbacks. Much of its energy is stored in a form of sugar that is difficult to tap into; this snag drives the cost of biofuel produced from seaweed up, and its viability as an alternative to petroleum-based fuels down. But now, a team of synthetic biologists may have found a way to circumvent this roadblock — and they're using a custom-built bug from your colon to do it. The bacteria in question is Escherichia coli. E. coli is commonly found in your lower intestines, and has a highly manipulable genome that has made it something of a mainstay in bioenergy research. Several studies suggest that if scientists can introduce the right genes into E. coli, and flip the switch on the right bits of genetic information at the right time, they can use it to convert the sugar from plants into biofuels with incredible efficiency. But not all biofuel crops are created equal. Many current alternative energy sources — corn and sugar cane, for example — require large quantities of fresh water and arable land to grow, thus depriving other important food crops of vital resources. Seaweed, which thrives in the vast, salty conditions of the ocean, doesn't need these things. What it does require, however, is an E. Coli bacterium specially designed for tapping into the energy that it stores in its primary sugar constituent. Now, researchers from biotech company Bio Architecture Lab (BAL) have genetically engineered a strain of E. coli that does precisely that. Our scientists have engineered an enzyme to degrade and a pathway to metabolize the alginate, allowing us to utilize all the major sugars in seaweed, which therefore makes the biomass an economical feedstock for the production of renewable fuels and chemicals. 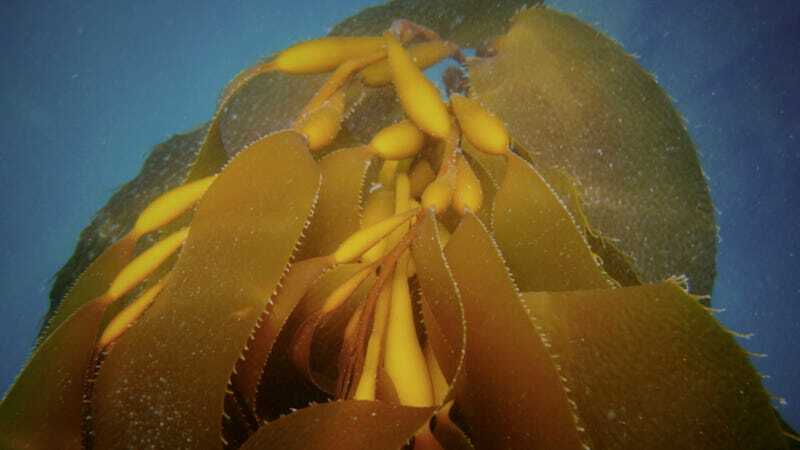 According to findings published in the latest issue of Science, the team was able to achieve an incredible 80% of the seaweed's maximum theoretical ethanol yield. According to Discovery News, that's twice what we're presently capable of achieving with sugar cane, and five times what we can do with corn. Of course, whether or not the researchers' process can be scaled up economically remains to be seen, and even if it can, other important questions must be answered. A big one, says Erik Stokstad in a perspective piece also published in this week's Science, especially for the U.S., is where to get seaweed in the first place. One report cited by Stokstad found that replacing 1% of the U.S. gas supply with ethanol would require 11,000 square kilometers of farmed seaweed. Seaweed is not farmed in the U.S. the way it is in other countries, and if had to be brought to the U.S. (or anywhere else where large quantities of algae were not readily available) from other parts of the world, it would raise the price of seaweed-based biofuels considerably, and also increase its carbon footprint. So just how viable is the seaweed, really? According to Stokstad, BAL has contracted an analysis to show exactly how competitive and "green" its process is, and results should be available later this year. The researchers' findings are published in the latest issue of Science. For more info on the process by which the research team engineered the E. coli to do its bidding, check out Stokstad's perspective piece, also published in Science [Subscription required]. Image courtesy of Bio Architecture Lab, Inc.